Red Velvet Chocolate Chip Cookies. I’ve got about four or five blogs that have been waiting in the wings for my recuperation from walking pneumonia. Waiting for me to be able to keep my eyes open long enough to pound them out. Today marks Day #1 of feeling well enough to meet the task, and blog #1 of what’s been brewing in my head. Today, I’m tackling the Red Velvet Chocolate Chip Cookies. Yes, you read that right. Red velvet, chocolate chips, in a cookie. It’s mouthwatering bliss. Being a clean eater takes dedication. A lot of it. Especially at first. But, once you get going, and into the groove, it’s super easy to breeze by all that bad, junky foods. Just like (in my case at least), it gets super easy to be able to successfully bake things from scratch. No, I’m not saying these cookies meet clean eating guidelines by even a fraction, but, the fact that you’re making them in your own kitchen is far better than buying these pre-packaged somewhere. I took part in a cookie exchange this year. I’m a pro at regular chocolate chip cookies, and pretty good at peanut butter cookies and chocolate chocolate chip cookies. I wanted to make something different though, so off to Pinterest I went. I pulled up the friend’s Pinterest page of whose name I was given for the exchanged and browsed around what she had pinned. 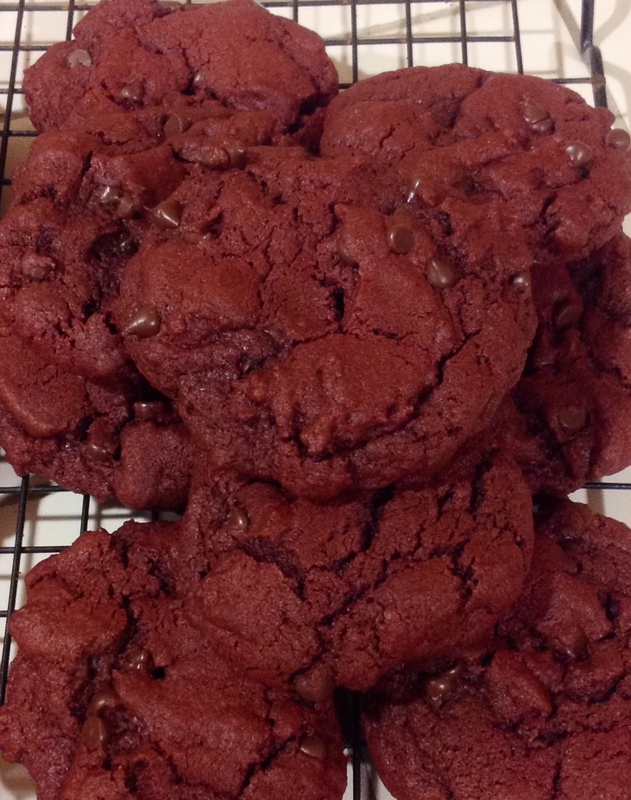 There they were, red velvet chocolate chip cookies. I clicked on them, but of course, there was no recipe, just a note saying to add dutch cocoa to the mix. So off to Google I went. I found a perfect, easy breezy recipe in two seconds at How Sweet It Is. I gathered all of my ingredients from various points in my kitchen and pantry, and proceeded to attempt to kill my decade-old hand mixer by making not one batch, but four. N ow, one thing to keep in mind is: They’re actually just simple, chocolate chip cookies with cocoa and red food coloring. So do not be expecting to compare them to the red velvet cake you had at your best cousin’s wedding two weekends ago. Cream butter and sugars together until fluffy in the bowl of an electric mixer. Add egg and vanilla and combine until smooth. Beat in red food coloring. Stir in cocoa, flour, baking soda and salt until just combined, scraping down the sides when needed. Fold in chocolate chips. Using an ice cream scoop, scoop out 1-2 tablespoons of dough and set on baking sheet. Bake for 10-12 minutes.